Check your emails for this offer so that you can RSVP for this event since you have to register from your email and it is limited to 60 invitations. 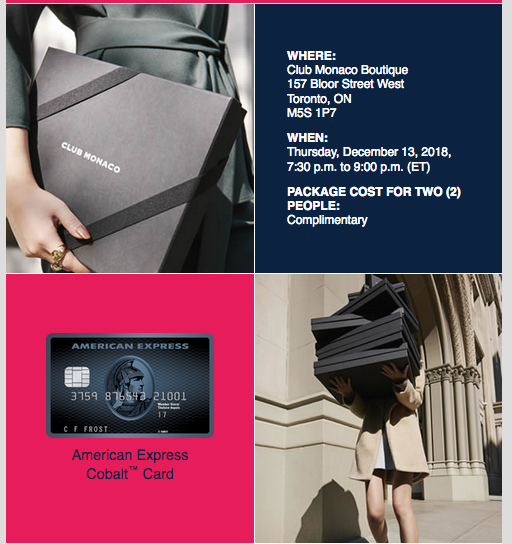 On Thursday December 13 Cobalt cardholders will receive 30% off select regular priced merchandise at the Club Monaco Boutique on Bloor Street Toronto. Good news is that if you can't make that event or don't live in Toronto like us Cobalt cardmembers can get 20% off (before taxes) on select regular-priced in-store merchandise at all locations across Canada from December 14, 2018 to December 31, 2018. You must present a copy of your email at the time of purchase to get the discount.